When I saw the powerful photo on Bing’s homepage, my first thought was, what could this artwork be? A cropped and colorized close-up of something infinitesimal, an image created by playing with perspective? My second thought was, oh no. 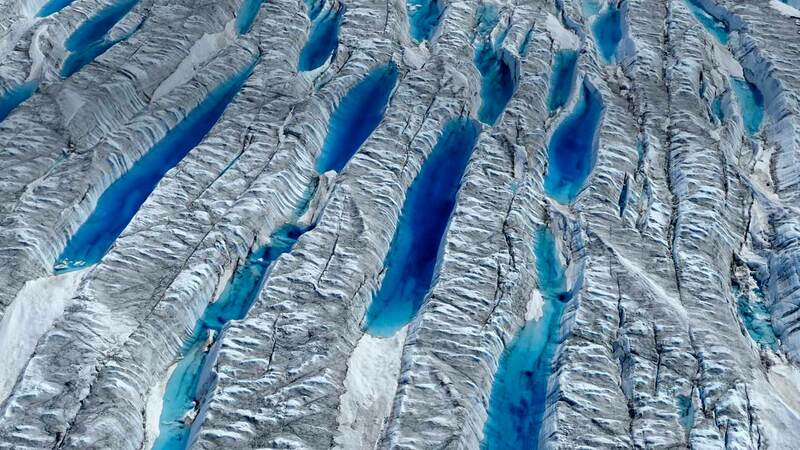 It’s a cropped close-up of Greenland’s ice field, melting. It is infinitesimal, I suppose, if your reference scale is the entire frozen island. I don’t think it’s colorized, though I couldn’t determine for sure from Bing’s website. The blue is melt water. The gray is probably soot and dust, absorbing the sunlight and converting it to heat. Why is destruction often beautiful? Let’s avoid sappy dorm-room philosophy about the link between destruction and rebirth. Facile spirituality about the cycle of life doesn’t get to the heart of the matter. I think it has to do with fractal patterns, which are the poster art of chaos theory. Think supernovas, or the spirals of hurricanes. Volcanoes. Thunderheads. Tornadoes. An iridescent oil slick. An explosion. Even the tsunamis that ravaged Indonesia and Japan had a certain awful beauty, seen from a distance. Beauty hypnotizes. It keeps us in the moment and pre-empts rational thought. It seduces us to disregard consequences. The seemingly chaotic has patterns and symmetries, and that contradiction resonates with something in our limbic system, and that resonance is beauty. (Notice the image on the Wiki link shows the brain itself to be a symmetrical fractal pattern—a product of chaos.) These patterns that replicate throughout the universe aren’t random at all, if seen at the right scale. That inspires awe. In the Great Oxygenation Event, the simplest forms of life mindlessly emitted oxygen that created a livable atmosphere for the highest form of life. Now that highest form is emitting carbon dioxide that may well destroy it, and we’re doing little more than watching it happen. I look at Greenland’s ice sheet deform and wrinkle and think, that is beautiful, mindless of the implications. There’s a terrible symmetry in that.